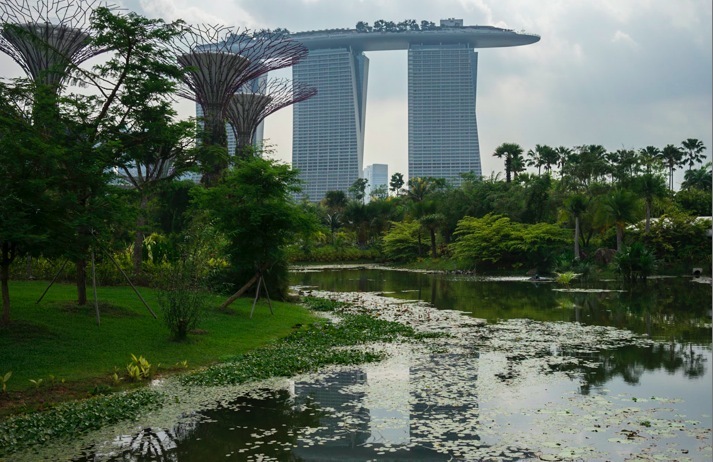 No trip to Singapore would be completed without visiting the magnificent Gardens by the Bay. 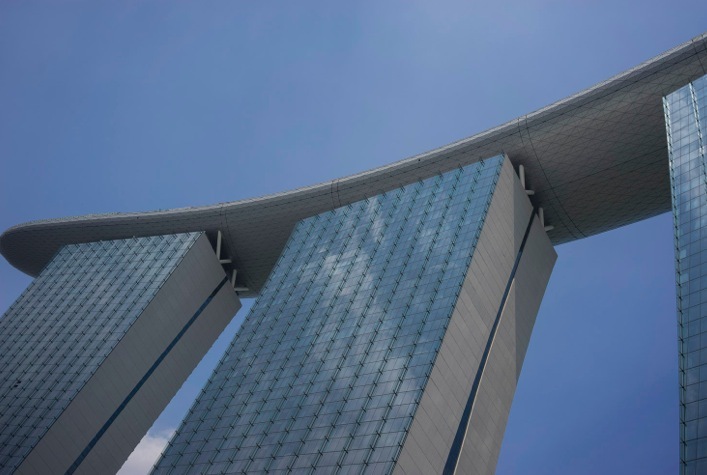 I’ve never had time to do this before, despite being so close (I visited Marina Bay Sands before), so this time I made an extra effort to go there. 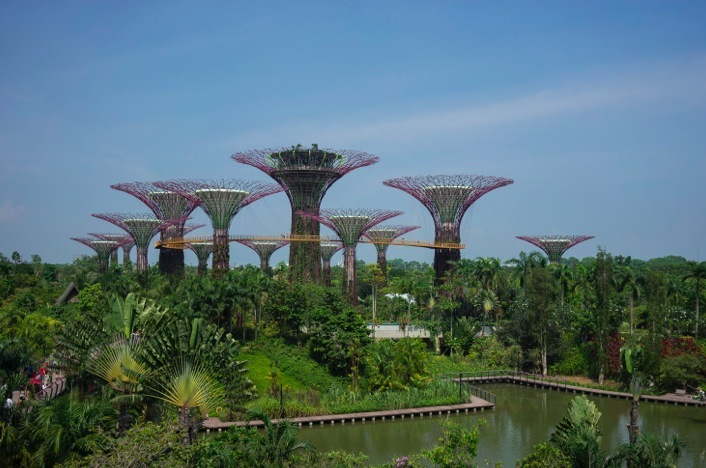 Gardens by the Bay is a huge park, consisting of three waterfront gardens: Bay South Garden, Bay East Garden and Bay Central Garden. 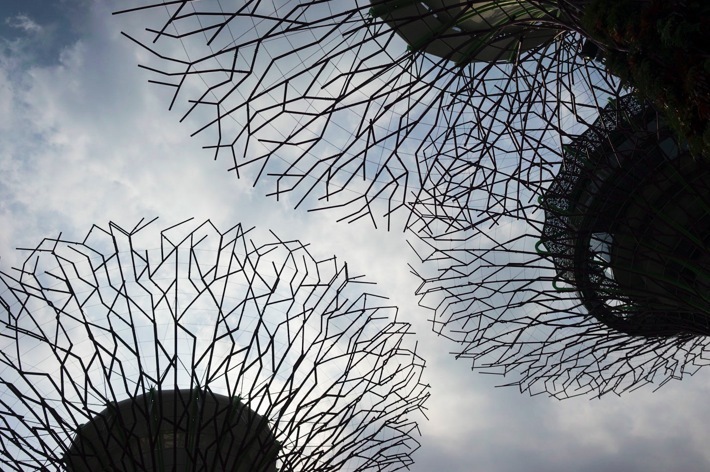 You can walk through the gardens for free, but to walk across the suspension bridge in the Supertree Grove and to visit the two domes in the Gardens costs extra. As it was a hot day, I only decided to visit the domes – and it was totally worth it. The Flower Dome’s footprint spans 1.2 hectares and stands at 38 metres, while the Cloud Forest is a more modest 0.8 hectares, but a dazzling 58 metres tall (to accommodate the 35-metre-tall “Cloud Mountain” and its gushing waterfall). The first dome I visited was the Cloud Forest. 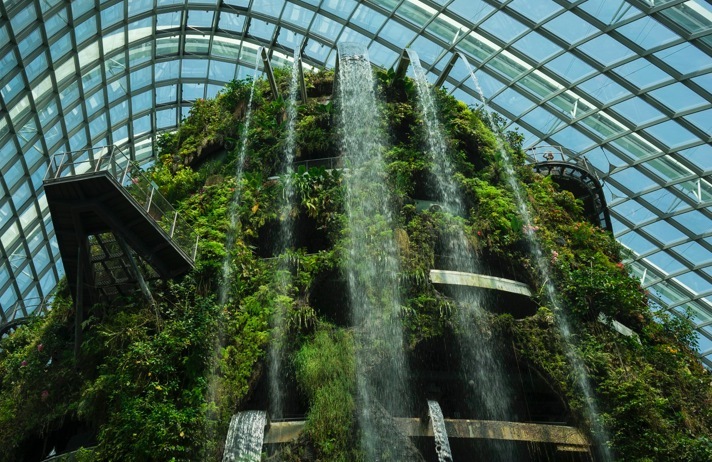 It is like a tropical paradise with greenery and a walkway about seven stories up – and a huge water fall! The entire surface of the mountain was densely covered in a mixture of fascinating ferns, orchids, bromeliads, begonias and deceptive pitcher plants. On the top, at the highest point of the mountain, is a tranquil, misty lake and a garden full of unique plant life that thrive about 2000 metres above sea level in tropical highlands. The Flower Dome mimics a world of perpetual spring, where unique plants bloom in an ever changing display of flowers. You can discover plants from the Mediterranean and semi-arid subtropical regions (e.g. parts of Australia, South America, South Africa). It is the world’s largest column-less greenhouse as the glass sits on a steel grid that acts like an eggshell. While I was there, the gardeners were decorating for a display of tulips… out of all the plants they could have picked, they selected the most boring ones. So I didn’t take any pictures there (plus the gardens were being remodeled, so it looked a bit messy). Head over to Anja’s blog and you can see the sea of tulips! Glad that you finally got to visit the Gardens by the Bay. They are indeed totally worth it and never bore me. Thanks for the blog mention, Ruth!